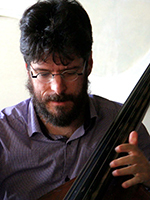 Joe Phillips is one of Canada’s most versatile double bassists. He performs with Toronto’s genre-defying Art of Time Ensemble, reimagines folk traditions learned from field recordings with banjoist Jayme Stone’s Folklife, struts his stuff with Payadora Tango Ensemble, performs annually at Sweetwater Music Weekend with some of the best chamber musicians in the world, and plays principal bass in the London Symphonia. Equally at home in a concert hall or at a folk festival, Joe has appeared as guest principal bass with the National Arts Centre Orchestra, the Canadian Opera Company Orchestra, has performed at the Celtic Connections festival in Glasgow, the Winnipeg Folk Festival, and toured Canada with chamber music supergroup, Octagon. When not touring, Joe lives in London Ontario with his partner and their two children.